The end of summer is a time both dreaded and worshiped. For students, it signifies the end of summer freedom and a return to the grind. For parents it means an end to constantly-present children and more free time to enjoy hobbies. Since returning is a bit of a strain on the students, we've come up with a few handy suggestions for smoothing over that first week. These back to school gift ideas are intended to allow relationships with teachers to begin on the right foot, allowing for the best possible year. The ancient favorite has always been to bring an apple on the first day, but that's a little stale for the modern world. We suggest a personalized arrangement of flowers, a gift basket, and a card. 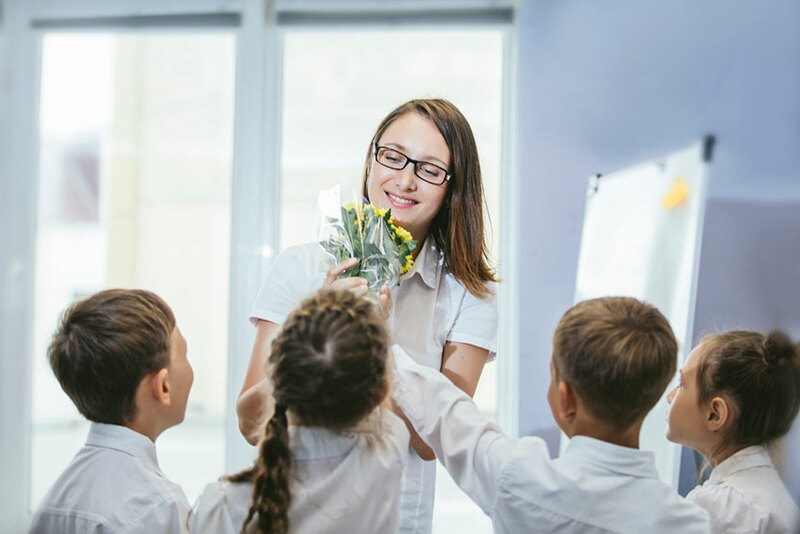 Of course, any one of these will do, but we recommend a combination of these popular items to ensure that your teacher will be as happy as possible. Combining flowers with useful books is a unique idea, as well, and one that the teacher will appreciate if you're able to determine their tastes beforehand. For additional back to school gift ideas, please continue reading below for more good advice. Now that we've suggested floral-based back to school gift ideas, we'd like to provide you with more helpful information to make the process of shopping and giving as easy as possible. Did you know that you aren't limited to buying flowers from our physical location? Thanks to the convenience of the Internet you can use our online store to shop for, pay for, and arrange delivery of anything you desire. Once you've found the perfect gift, proceed to our secure ordering form and arrange payment. From there, you can arrange for delivery and enjoy a same-day guarantee that assures your order will arrive fresh and on time – every time. So if you're wondering what would make the best choice, these things include some of the best ideas that you could ever desire. There are many reasons to buy flowers – the cost, their natural beauty, the fact that they are loved by everyone. When you give flowers, you're giving something that will keep the recipient in good health and high spirits. It also has a personal touch that can't be beat! If you have any questions about flowers, or about back to school gift ideas, we invite you to contact us at any time! We'll be happy to help.